Water absorbent bath mats are the perfect addition to a bathroom to catch all drops of water when stepping straight out of the shower or bathtub. Designed to absorb water, and preventing you from trucking water all over the place, they also work to keep the floor beneath them dry, ensuring a safer bathroom floor with no possibilities of slipping and floor damage. 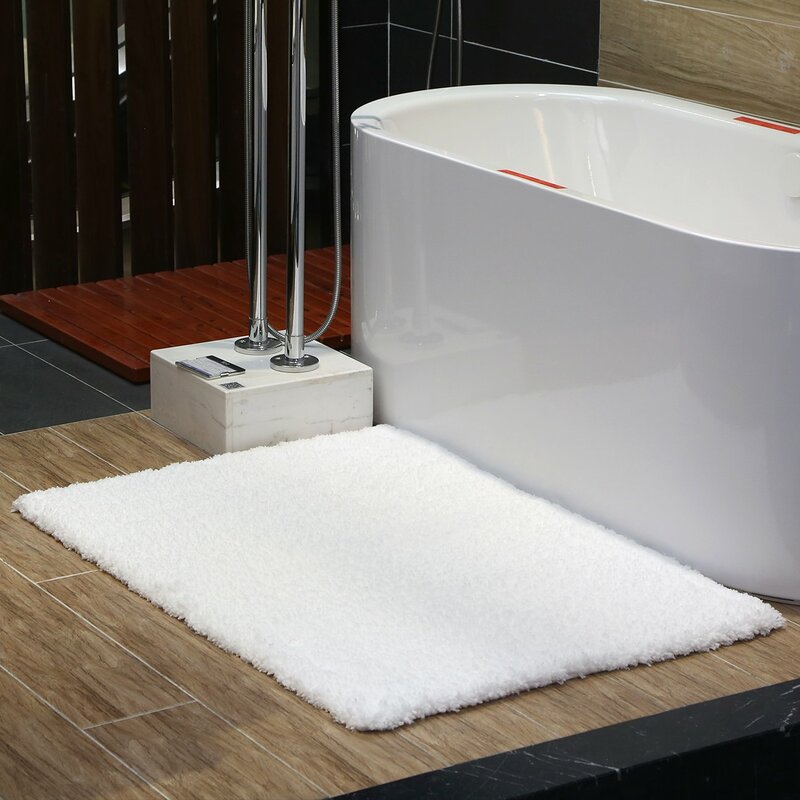 KMAT’s luxurious 100% microfiber bath mat aims to combine practicality with decorative use! Complete with non-shedding thick shaggy piles and an extremely durable stain resistant covering, this water absorbent mat is fluffy ,cozy and ultra soft touch and includes an essential natural rubber non-slip bottom. KMAT’s product is a larger and thicker mat than usual but can be purchased in a variety of sizes from 20” x32” all the way through to 4ftx3.6ft, with a choice of white or khaki coloring. The more times you stamp around on this mat, the less it will shed its fibers. Fully machine washable or by hand, this is one mat which is simple to take care of when not in use. Customer reviews of the KMAT luxury bathmat rate this product as a most comfortable and efficient moisture absorbing product. The availability of such a larger size mat is also well received. Lifewit sells a premium fabric bath mat which is designed to remain securely in place when in use. 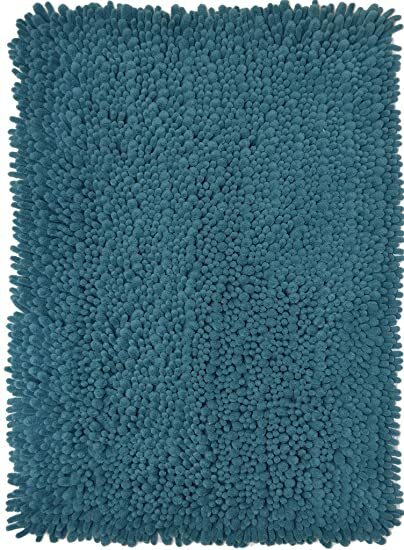 Available in a selection of sizes from 23”x 70” to 47”x 17” Lifewit’s bath mat is made from premium microfiber and offers a softer shaggier looking water absorbent product. With its construction of soft finer piles, it can rapidly absorb any water placed on its surfaces. Additionally, with its soft twill design, Lifewit believe this a is a mat which you will want to place on full display in your home given that is is plush, comfy, pretty and above all functional! Machine washable and easy to care for, the base of the mat is entirely non-skid and sticks firmly to the floor,providing excellent protection for all who use it. 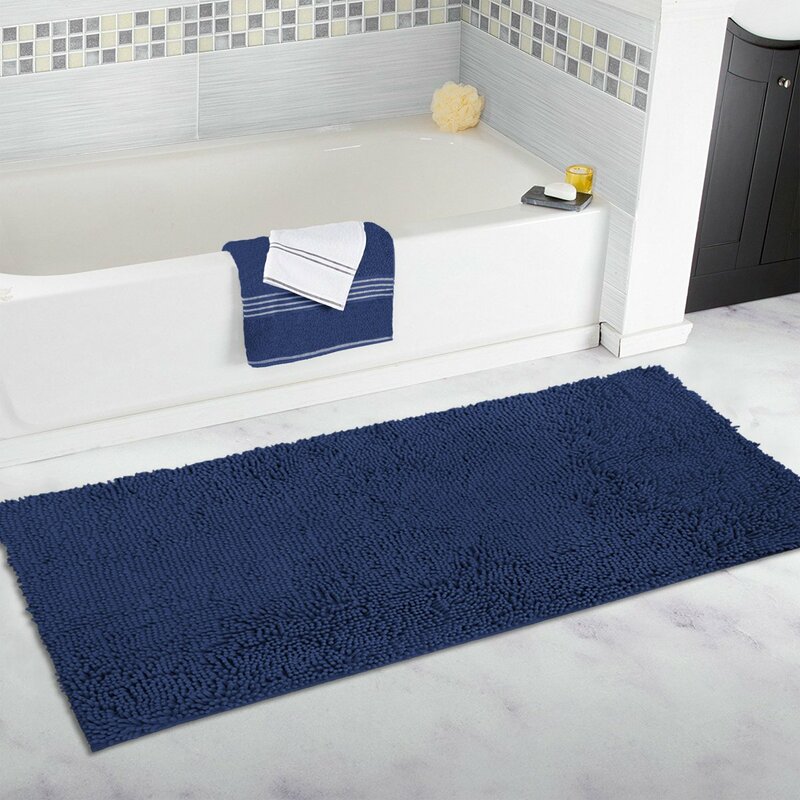 Customer reviews of the Lifewit soft shaggy bath mat state how not only does this product hold the water well, but it is effortless to wash for reuse. Mayshine produce a stunning array of absorbent bath mat runners, all in some vivid color choices! 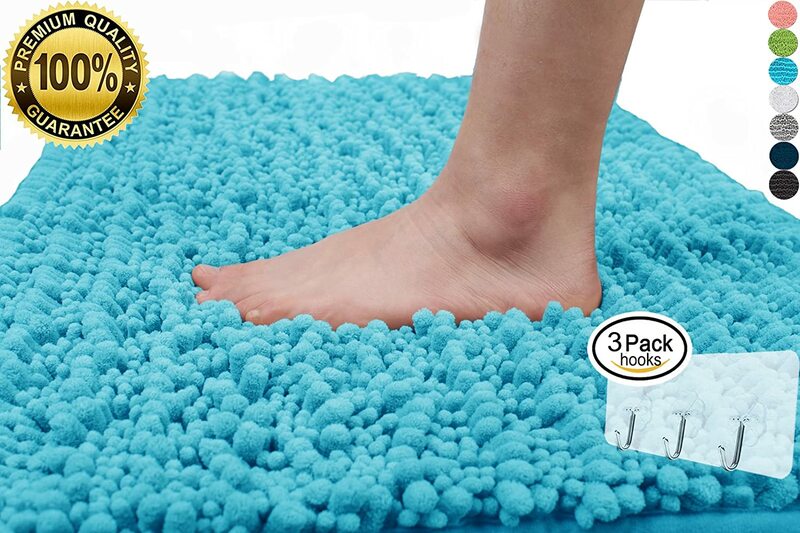 With plush microfibers and 6mm comfort foam used in the material of this mat, the effect is designed to feel as though your feet are massaged every time you stand on Mayshine’s bath mats. All in one standard size of 27.5” x 47”,colors include blues, browns, green, grey and black. With a strong ability to absorb water, it works at keeping the floor clean and comes complete with an anti-skid bottom, ensuring safety. Hand washed or fully machine washable, this rug is suitable for 6kg plus washing machines. Customer reviews claim the Mayshine bathmat is undoubtedly the ultimate in softness, and its uniqueness is its piling that looks fresh and new after every use. Drhob’s bathmat comes complete with exclusive memory foam and claims to be a mat that can be used for much longer than other competitors’ bath mats. Available in packs of two, this mat is one size, 17” x 24”,and in colors black, white, green, grey and wine. The memory foam works to relieve pressure on the feet, providing a softer touch, changing back to look as good as new after each use. Super absorbent, the mat is made from 100% coral velvet fabric, finished with an anti-skid backing and natural latex bottom. Though it’s machine washable, it should be on cold cycle allowing it to return to its perfect shape after each wash. Customer reviews highly recommend the Drhob mat for super softness, plus the addition of two mats in one pack make it a more practical purchase. Momentum Homes absorbent bath mat is aimed at providing a super soft pillow like experience for all feet! In four beautiful color choices of Ivory, teal, white and grey and sizes from 17” x 24” to 24” x 40”, this mat is highly absorbent and keeps the moisture within its microfiber bristles, and off the floor. Super soft and plush, its thick microfiber bristles combine to look great and ultimately feel great. Completely machine washable and dryer safe, this product has a non-slip backing attached. Customer reviews suggest these mats hold a lot of water moisture but still offer a soft sensation underfoot. They also tend to wash thoroughly and retain their bright colors. The Yimobra claims to that the density and plushness of their bath mat surpasses that of most other brands. Measuring 31.5 X 19.8 Inch this mat is made using microfiber to not offer exceptional comfort but support as well. Aside from being super absorbent, it comes with an adhesive backing that is facilitates faster drying and prevents slipping. It is machine washable and can be folded effortlessly for storage. It is currently available in 6 colors and includes 3 seamless hooks. 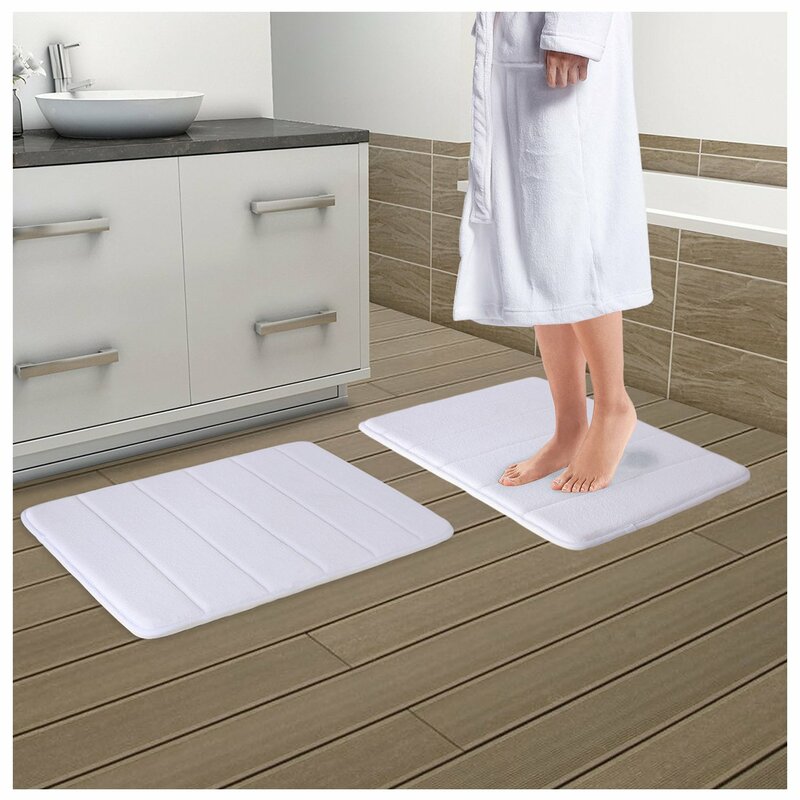 What customers love most about this bath mat is that is feels super comfy on the feet, absorbs the water as it should and stays put, therefore safe to have in the bathroom. Made of coral velvet feel microfiber for a super soft and cozy feel plus polyurethane memory foam filling, Genteele mat is not only usable in the bathroom because of its absorbent properties, but can be used in other rooms including the bedroom. Machine wash in cold water, the mat is backed with PVC dots to prevent shifting and skidding. It is available in 3 sizes; 17″ X 24″, 20″ X 32″ and 22″ X 36″. What customers note about this mat is that is does what it advertises. It absorbs water effectively, does not slip, cozy and soft to step on, all the while looking elegant as it performs this functions. Absorbent bath mats need not be dull and boring. In a variety of sizes, and indeed beautiful color choices, they are worth the investment and official practical and visual advantages. So, next time you find yourself reaching for that towel to place on the floor, why not contemplate purchasing a bath mat instead?